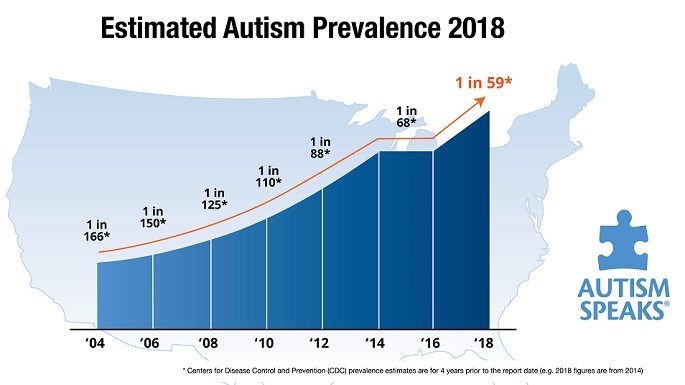 When medical science finally settles on more precise terms for the epidemic that is presently called ASD, we should also be able to recognize and appropriately treat the various expressions of the disorder. This is important as it relates to interventions that address specific problems, such as in the G-I tract, and their downstream consequences, such as disruptive behaviors. The categories are not exclusive, the list is far from complete, and I hope to expand on this topic in the future. 1. ‘Typical’ (present from the earliest stages of development) and Regressive types. I’m not so sure that the only difference isn’t timing; i.e., when the patient became affected. Parents may be more likely to identify the latter type in association with childhood vaccinations. Otherwise, there aren’t big differences in presentation or the ability to diagnose underlying problems that are amenable to treatment. 2. Girls and Boys. There is a difference because of the amount of aggression in many boys, and the relative lack thereof in the majority of girls. This was previously discussed here. The G-I system is the most glaring problem. This has been written about at length, and throughout this website. The CNS shows significant involvement. There could be seizures, staring spells, or other unexplained motor episodes. Treatment may involve anticonvulsants and often becomes fairly complicated. The immune system is the presenting problem. Some patients have eczema covering their entire body, others may have asthma and many have frequent infections. Laboratory tests may identify an over- or under-functioning ability to clear inflammation. Enabling the patient to achieve better health often helps lessen or even ameliorate behavioral and other ‘autistic’ disturbances. The disorders known as PANS/PANDAS appears to be consistent with such impairment. The muscular system functions inefficiently; as evidenced by low tone, poor chewing, clumsiness, extremely flat feet and/or poor posture. When patients can tolerate oral glutathione and subcutaneous methyl B12, there is often significant improvement in not only OT, but S&L as well. 4. Variations due to age at diagnosis and intervention. Evaluation and treatment is different for toddlers, adolescents or adults. As patients get older, more patience is required and the coping skills of the individual become more important in addressing and assessing therapies. The age at which children continue to suffer apraxia is especially important. Imagine the difference in outcome for children who have no speech even by 3rd grade as opposed to youngsters who only experience a 1- or 2-year delay. 5. ‘High-‘ and ‘low-‘ functioning individuals. I object to these terms because they are pejorative, judgmental and inaccurate. After all, there are plenty of ‘low-functioning’ neuro-typical people! Many patients have a great deal more awareness and skill than is apparent. More correct designations would be disruptive, aggressive, “extremely sensory” or “prone to wander.” Understanding and treating any identifiable underlying abnormalities often leads to significant functional improvement. 6. Patients who present with genetic variations. There are major problems, such as children who have Fragile X (males) or Rett’s (females) syndrome. Less obvious are copy number variations that may confer an inability to detoxify. Very small changes in genetic information magnify in importance as our environment becomes more polluted. This has been discussed in more detail here. Most of the time, there are no identifiable abnormalities. 7. Significant metabolic abnormalities, evidenced by under-functioning mitochondria, or out-of-range fat, vitamin or mineral levels. Such variations require investigation, and are often amenable to supplemental intervention. 8. Those who look as if they escaped traditional ASD. There is a small percentage of patients presenting to the Child Development Center of America who are brought in by the parents because of behaviors that, “You just can’t put your finger on.” Although these children may not have the traditional criteria of social isolation, repetitive behaviors and speech and language delay, they have other associated difficulties with hypotonia, poor sleep or frequent infections that have resulted in developmental challenges that are often characterized as either anxiety, focus or both. It is neither fair nor accurate to state “‘DAN!’ doctors all do the same thing for the patients.” Any professional will have a starting point based on the chief complaint that is specialty-specific and subsequent treatments and labs depend on the response to the first line of treatment. Based on just these categories described above, and the doctor’s experience, there are a number of routes and variations that the workup and ensuing interventions might follow. Families need an experienced practitioner to recognize the different presentations of autism in order to make sense of the complex matrix of signs and symptoms and to offer appropriate, effective, reasonable, reproducible and verifiable results. This entry was posted on Sunday, August 11th, 2013 at 8:20 am	and is filed under >ALL<, Alternative and Complementary Medicine for ASD, Autism Therapies, Earliest Red Flags, Patient experiences, Reversing autism, Speech and Language, Vaccines. You can follow any responses to this entry through the RSS 2.0 feed. You can leave a response, or trackback from your own site.